Baker Mayfield earned himself the Heisman Trophy by putting up gaudy numbers during the 2017 season, but it was an impressive victory over Ohio State that made him the favorite from the start. 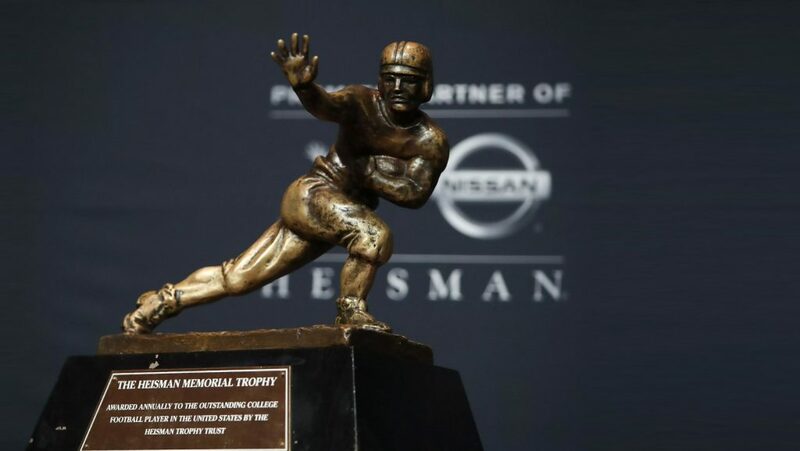 There are those who wonder who will be the 2018 Heisman Trophy winner, and how that person will establish himself as the clear-cut favorite. Unlike in years past, it is a pair of running backs who are considered to be the top candidates heading into the season, but there are a group of quarterbacks who will be in the spotlight as well. Here are the front-runners heading into the upcoming campaign with odds provided by Delaware Park Sportsbook. Jonathan Taylor, RB, Wisconsin (+750) – that Taylor is considered to be the favorite should be of no surprise to anyone. The freshman burst onto the scene, rushing for 1,977 yards while posting a gaudy 6.6 yards per carry average. He was an absolute beast to try to bring down last season, and sees his entire offense of line return this season. We had nearly 300 carries and that will likely not change the season, aiming that the Wisconsin coaching staff will give their star running back every opportunity to carry the ball. Consider also that he is just 19 years old. He is still growing into his body, not a pleasant thought for opposing defenses. Bryce Love, RB, Stanford (+800) – Like Taylor, Love made a name for himself in 2017, rushing for 2118 yards while posting a ridiculous 8.1 yards per carry average. He was a unanimous first-team All-American and finished second in the Heisman Trophy voting. What separates him from Taylor is that he will be a senior, meaning that there may not be much more upside to his performance than what was seen in 2017. However, if he is able to duplicate last year’s performance there is no doubt that he will be a top two candidate once again. Tua Tagovailoa, QB, Alabama (+900) – Tagovailia is considered to be the third most likely candidate to win the Heisman. What makes that so unusual is that not only are they basing this off of one game, his performance in last year’s championship game, but it is not even assured that he will be the starting quarterback. Junior Jalen Hurts has an excellent opportunity to reclaim his starting job, especially after being a Heisman Trophy candidate himself last year. There’s a whole lot of confidence that he will get the starting job and be every bit as good as what we saw against Georgia. Trevor Lawrence, QB, Clemson (+900) – This is another surprising choice by the oddsmakers, as Lawrence may also be spending much of his season holding the clipboard on the sidelines. Senior Kelly Bryant returns after throwing for over 2800 yards and rushing for over 650 more, and it is surprising that there are many who believe that Lawrence will win the starting quarterback job in Clemson. He is only a freshman, albeit a highly touted one, but it is more likely that Bryant will maintain his role as the starting quarterback with the freshman on the sidelines learning under his tutelage. Interestingly enough, Bryant is ranked at +2000 odds of winning the award as the nation’s top player. Jake Fromm, QB, Georgia (+1200) – here is one quarterback who deserves a great many accolades after his freshman season. Fromm through four 2615 yards and 24 touchdowns in his freshman campaign and much more is going to be asked of him in the upcoming season. He lost both of his starting running backs, both of whom graduated, and half of last year’s starting defense has graduated. This is a team that still has championship aspirations, and they are likely to go only as far as the sophomore quarterback can take them. With added responsibility comes added opportunity for success, and this will be Fromm’s opportunity to prove that he is the best player in the country. Interestingly enough, it is only one upperclassman who is considered in the top five, and two of these choices may not even take the field on a regular basis. That really makes this a three horse race and is where you are likely to find your greatest opportunity for success.